2) Because of Jesus’ bodily resurrection we can be assured that we too will be raised (1 Cor. 15:20-28). 4) Jesus became Lord of all at the moment of His bodily resurrection (1 Cor. 15:24-28, Acts 2:36, Romans 1:3-4, 10:9, Phil. 2:9-11). 5) Because of Jesus’ bodily resurrection all enemies have become subject to Him and have been or are being defeated by Him (1 Cor 15:28). 6) Because of Jesus’ bodily resurrection a day of judgment is coming in the resurrection of both those who believe and those who don’t (1 Cor. 15:33, 2 Cor. 5:10). 8) Because of Jesus’ bodily resurrection complete and utter victory has been won Christ (1 Cor. 15:50-58). 9) Because of Jesus’ bodily resurrection we will be raised in bodies that will not perish. We will be like Him. (1 Cor. 15:50-58). 10) Because of Jesus’ bodily resurrection we are not to lose heart and can live lives now in hope of what is to come. In other words, the resurrection of Jesus is an indication that this is not all there is. We can endure, we can suffer, we can persevere because we know in the end we won’t just die. Because God raised Christ, God will raise us (2 Cor. 4:7-5:10). 12) Because of Jesus’ bodily resurrection we can avail ourselves of the power of God in resisting sin and temptation. This same power is ours. 14) Because of Jesus’ bodily resurrection we have been and will forever be adopted as God’s sons and daughters (2 Cor. 5:1). 15) Because of the bodily resurrection of Jesus these temporary troubles that vex us are really only light and momentary afflictions. They will give way to glory that will be revealed at the day of the resurrection. Death will be swallowed up in life (2 Cor. 5:4). 16) Because of Jesus’ bodily resurrection we need not fear death. This enemy has been overcome. 17) Because of Jesus’ bodily resurrection our lives are now hidden with God in Christ. In other words, new life, resurrection life, life in the power of the resurrected Jesus is at work in us to transform us and change us into the image of Jesus Christ. This is great hope for us! For those of us that our grieved by our own sin there is good news. Sin is being put to death in us. The fruit of the Spirit, which is the Spirit given because of Jesus’ bodily resurrection, is being made manifest in us. When you get discouraged because of your sin remember the Spirit of the resurrected Jesus is at work in you. 18) In the bodily resurrection of Jesus a new day had dawned, a new creation was brought forth. Old things have begun to pass away. If you’ve ever experienced the gnawing low-grade discouragement of besetting sin you may have asked the question, ‘Will I ever change?’ Or you may have wondered if there is any hope for the nagging patterns of sin in your spouse, friends or children. The power for real and lasting change is resident in the objective reality of the person and work of Christ. Let me say it a different way - real and lasting victory over sin is achieved only through trust in Christ’s objective victory over sin. Christ achieved real victory over real sin. The frequent encouragement in Scripture is towards certain behavior, but that behavioral change is always rooted in the person and work of Christ in His real, historical, objective, and effective victory over sin. Theologians have called this the indicative (that which is objectively true) and the imperative (that moral action which God requires). The imperative of gospel behavior is rooted in the indicative of gospel truth. God declares something so based upon His righteous action, and right behavior is a moral action based upon this declaration and action of God. In other words, what God has accomplished in an historical event and has declared to be so is the impetus of my obedience. I work out my salvation because God has already worked and not vice versa. This gives true hope for gospel change. Join me in thanking God today for His indicative that enables His imperative. 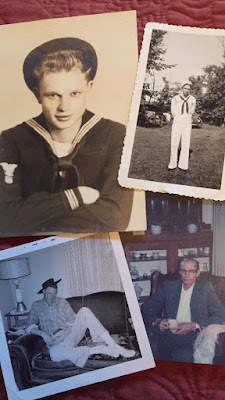 I have a story to tell about a young second-generation Norwegian-American. He was born in Minnesota in 1924. The son of hardy Nordic stock, and being raised in a tight Norwegian community, he never spoke English until he started grade school. In fact, until the day he died his strong Norwegian accent never abated, this despite being born in the US. At age 17 he left home to join the military. In 1941 World War II was in full force and because he was 17 he needed special permission to join the Navy. For whatever reason his parents would not grant permission, but he was able to convince an aunt and uncle to sign the waiver. Though he joined the Navy he was never able to swim very well. This was a bit problematic since he was twice in open ocean combat zones in the theater of war, and twice he had naval vessels sunk from under him, having had to spend time in the ocean awaiting rescue. One of those times he was picked up and sent to France. The second time he was picked up by Russian allies and taken to Russia. During his time in Russia he tried to join the Norwegian Resistance, which was an underground resistance group organized against Hitler and the Third Reich, but he was refused since he was an American citizen. For his bravery he was awarded several medals and awards. When he returned from the war, and after he married, he was so stricken by the sights and sounds and memories of battle that one day he walked into the forest, away from their Minnesota farm, and threw the medals as far away as possible. He was loath to talk about his experience. In fact, we don’t know much more about his war-time experience. George Vernon Amundson died in 1989 at 65 years old, suffering for years the effects of war in his body. George Vernon Amundson was my father-in-law, Judy’s dad, and a dear Christian man. Who will remember? Who will remember George Amundson? Who will remember the names of the soon-forgotten heroes, and who will remember the reason men and women make sacrifice, some of them the ultimate sacrifice? This is why Veteran's Day is important. This is why remembering is important. We mustn’t forget them or their stories.